Research published today in the open access Nature journal Translational Psychiatry, found patients with severe mental disorders who had experienced childhood abuse to have shorter telomeres, a predictor of biological age. Here, Monica Aas, lead author of the study, tells us about the findings and what the next steps are for the field. 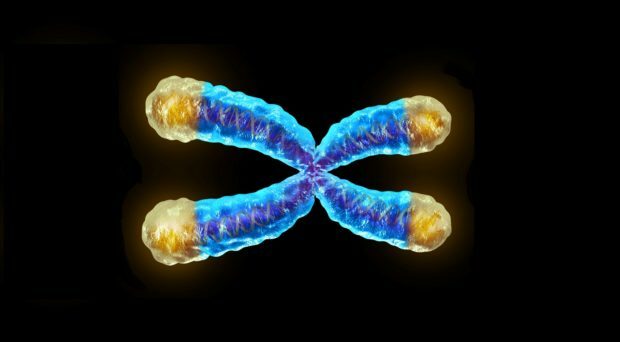 Telomeres are DNA-protein structures at the tails of chromosomes that shorten with increasing age in most human tissues. When a cell divides, the end of the chromosomes is not replicated. The telomeres will thus become a little bit shorter with each cell division. When telomeres become critically short, the cell’s ability to divide is impaired and the risk of cell death increases; this may eventually compromise tissue renewal capacity and function. Telomere length may, therefore, represent a ‘molecular clock’ that contributes to aging. Recent research indicates that telomeres are influenced by genetics, but also by the environment we live in. Our findings support the work by Elisabeth Blackburn and colleagues suggesting that stressful life-events reduce telomere length. Our study of more than 1000 individuals contributes to new knowledge about telomere length in severe mental disorders such as schizophrenia and bipolar disorder. Firstly, we found that older participants had shorter telomeres than younger individuals, thus supporting the principle that telomeres shorten with age. Moreover, patients with severe mental disorders had on average shorter telomeres and reported more childhood trauma experiences than the healthy control group. Patients reporting childhood abuse had the shortest telomeres, suggesting a link between early stressors and accelerated cellular aging, which until now has not been reported in schizophrenia or bipolar illness. In order to progress research in this field it is important to replicate these findings in independent samples. We also need to explore the clinical implications. For example, patients with schizophrenia and bipolar disorder have on average 10 years shorter life expectancy than the general population. What is the link between shorter telomeres and shorter life expectancy in this group? Another area to explore is whether we can change our environment to alter the length of our telomeres, since we know that the environment influences them. For example, could techniques to reduce stress levels also have a positive effect on our telomeres, such as physical exercise or meaningful social relationships? Perhaps most importantly, we need to understand what the biological mechanisms are linking stressful life events to shorter telomeres. Potential candidates include higher cortisol levels (the main stress hormone) and increased inflammation. And finally will our genetic make-up influence how the environment impacts our telomeres? Another main challenge at the moment would be that the majority of studies are comprised of small sample sizes, resulting in potential underpowered studies. To expand our knowledge on the role of stress and telomeres, we should collaborate across disciplines and across sites. Monica Aas is the Principal investigator (PI) on the project “Stress Under Skin” (SUS). NORMENT, Centre for Psychosis Research, Division of Mental Health and Addiction, Oslo University Hospital & Institute of Clinical Medicine, University of Oslo, Norway. Monica has a PhD from Kings College London, and has received 12 international research prizes for young researchers. She is passionate in exploring the interplay between genes and environment, creating and presenting widely accredited papers and delivering lectures on a range of topics, including examining the link between early trauma and development of psychiatric disorders. Monica is also a member of the Young Academy of Norway founded on in 2015.